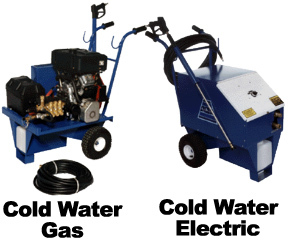 ADF manufactures cold water style washers in all models, both gas and electric. Cold water is not recommended for grease and oil applications, but is well suited for cutting action and "pushing" heavy grime. Higher pressure models used for building cleaning and stripping before painting.